Transportation brokerage is all about relationships—and that means it’s also about communications. To match loads with the right capacity and make sure all the details of a shipment go well, you must find out as much as you can about the needs of both your shippers and your carriers. What special services and equipment does the shipper require? What are the windows for pickup and delivery? Which lanes does the carrier most want to serve? What special equipment can it offer? Sometimes good communications require a direct human touch—the in-depth exchange you can achieve only by picking up the phone. But technology is also a terrific aid to communication. With help from software solutions available today, there’s a lot that brokers and carriers can do to share information more effectively, so they can avoid costly misunderstandings and delays. Good communication is the key to a smooth transaction. Think about pickups and deliveries, for instance. The broker needs to gather as much detail as possible about what time the driver should arrive, where to go and what the loading or unloading will involve. Get any of that information wrong, and the driver could lose time looking for the right dock door, or sitting around waiting to get back on the road. Those miscommunications hit drivers right in the wallet. That’s more true today than ever, now that the federal mandate for electronic logging devices (ELDs) is in full effect, making every minute count for drivers. Delays caused by poor communication can cost money for shippers, too. Imagine the shipper who hires temporary workers to unload a truck, only to learn that the truck will arrive two hours later than scheduled. The shipper is forced to pay the temps for that unproductive time. Or consider what happens when you tender a load. You might know which lanes a carrier wants in general, but do you know how those preferences change toward the end of the week, when the carrier is trying to get truck drivers back home? Each time you send an email offering a load that the carrier won’t even consider, you’re interrupting someone’s work, wasting their time (and yours) and creating friction in the relationship. When one of your regular shippers gives you a load, your system puts all the necessary information about that shipper’s needs and preferences at your fingertips. When you acquire a new shipper, or one of your regular customers asks you to handle a new commodity, or go to a new location, your software prompts you to ask the right questions. Then it uses the information you gather to inform your subsequent decisions. 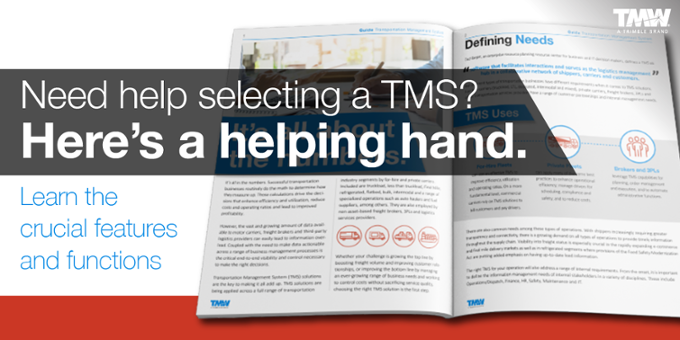 Your TMS also stores critical information about carriers, and applies that data as appropriate. When a shipper needs freight picked up in Chicago on Wednesday and delivered to Atlanta, your system knows which carriers with the right equipment are often looking for loads in Chicago midweek. They’re the ones you’ll reach out to first. 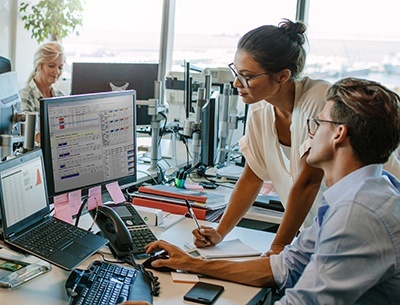 Using transportation management software to make good decisions, based on accurate information and a set of standard business rules, can help you avoid all kinds of problems that arise from miscommunication. You manage just-in-time freight differently than freight that’s going to be stored in a warehouse. You handle a hazmat load differently from a load of fresh vegetables. As a broker, you don’t want to make your employees ask each shipper a long list of questions about every load, and then relay all that information to your carriers. Those discussions take time, and they create opportunities for human error. When you use a TMS, if a shipment requires a flatbed trailer, a driver with hazmat certification, delivery within a specific half-hour window or any other special provisions, no one needs to remember those facts. Your database already contains information on what your shippers require, and what each carrier can provide. You’ll offer each load only to carriers that can handle it, and you’ll provide all the right shipment details in your instructions to the carrier. When you use a TMS to automate routine transactions—the vast bulk of your activities—that gives employees more time to solve problems and cement relationships. The software also makes it easy to spot exceptions before they escalate into problems. For example, if the system alerts the broker that a shipment will arrive 30 minutes late, he or she can call to advise the customer. The customer appreciates the chance to make adjustments, perhaps rescheduling some workers. The carrier might be grateful as well, if those adjustments help get the driver promptly back on the road. While current transportation technology provides a great deal of help in fostering good communication between brokers and carriers (and, of course, with shippers), we’re bound to see even better tools in the future. One promising development is blockchain, the emerging technology that creates an encrypted, unalterable log of every transaction between two parties. It’s not yet clear how blockchain will figure in transportation and logistics. But it looks like a promising way for shippers, brokers, carriers and consignees to share unambiguous information, increasing accuracy and the level of trust all along the chain. For now, though, one of the best practices for fostering better information sharing between brokers and carriers is to train employees to take full advantage of their TMS. Develop a set of processes that work for your business, teach your employees to access the right information, make sure they can repeat the right steps for all their day-to-day work and train them to spot exceptions. With well-oiled procedures, and good technology to support them, brokers and carriers can reap the benefits of better communications. Ready to get started? Contact us for a meaningful conversation to put you on the road to business success.